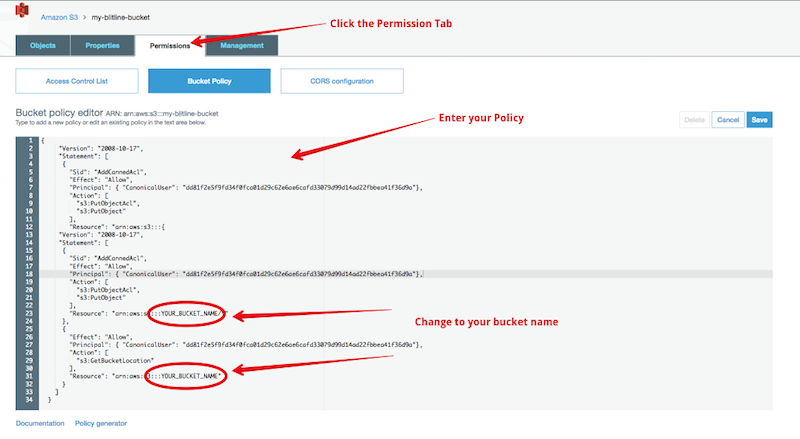 It is VERY important that you set your AWS Canonical ID on your Blitline.com account if you are going to let Blitline push images to your bucket. You can set the Canonical ID by logging in to Blitline.com, and locating it on the logged in homepage. Without the Canonical ID, we cannot make YOU the owner of the image. Even though it is in yourbucket, Blitline will still be the owner of the object and you will not be able to do anything to it (such as rename, or re-permission) and your only option will be to copy it somewhere, thus making you the owner of the copy. SO, make sure you set the Canonical ID! HOW DO I GET MY AWS CANONICAL ID? On this screen you will click the Account Identifiers section. Copy and paste this into the Blitline.com homepage Canonical ID section, and click the Updatebutton. Please make sure you have already set your Canonical ID before proceeding. You will need to give Blitline permission to write to your S3 buckets. This permission policy above allows Blitline to write to your bucket. "key" : "key value to save image as"